Confession: I have spent an inordinate amount of time trying to perfect a one dish mac-n-cheese recipe. 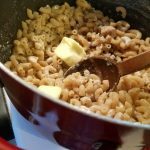 I like macaroni – any kind – and my children are bigger fans than I. I grew up with the creamy, cheesy variety, and that’s the kind I’m talking about today, though as an adult I discovered southern style baked macaroni, with crisp edges and oven-browned butter on top. Yum. But I have a few problems with making creamy macaroni and cheese from scratch. 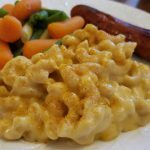 I don’t like washing separate pots for cheese sauce and pasta (I’m not that fond of dirty dishes)… And I’ve had trouble finding a mac-n-cheese recipe that will turn out smooth and velvety in the crockpot. Second, if you slightly undercook your pasta, then add plenty of milk and cheese to the sauce, you can cook it up on a Sunday morning, put it in the crockpot for a couple of hours, and come home from church to find it just about perfect. That’s how this recipe turns out best, though you can reduce the milk (and/or cheese) and serve it immediately. One disclaimer: I’m not big on processed cheese like Velveeta, but I haven’t found its equal for homemade mac-n-cheese. I’d like to get snooty and try this recipe with a mixture of good melting cheeses like Muenster, Gruyere, and Havarti, but I’m not the kind of person who ever has them on hand in quantity. I don’t even know how to say Gruyere, but I know it melts well and it looks good on paper. Never mind, I just looked it up. GROO-yair. If you try it with this recipe, let me know. Back to Velveeta. Vel-VEE-tuh. Cook macaroni according to shortest package directions (or one minute less), until nearly tender. Drain well. Gently stir dry flour into macaroni until just combined. Cover and cook over low heat, stirring frequently, until melted, thick, and smooth. Add cheddar if desired. Serve immediately, or put in a crockpot and warm on Low for 2-3 hours. I haven’t shared a recipe on my site for months. My tech support guy suggested trying this Recipe Maker tool. What do you think? Does it make things easier or harder for you? What are the trademarks of the kind of macaroni you like? Love that even Pennsylvania Mennonites eat WEE-ners with mac and cheese. ? I think I deleted my comment by mistake. I had said my mama made the the most delicious mac n cheese in the oven and it was so delicious. I also said your Mac n cheese looks really yummy and I avoided licking the screen.? We love Mac n cheese. Half like it crusty and half like it runny ? why can’t I ever make a dish and everyone be happy ?? My husband asked me to stop using processed cheese. I found that the marble cheeses worked best. Sometimes I shred my own but usually just buy whatever mixture Walmart has on the shelf. It does change the flavor but it can’t be helped. Good for you. 🙂 I think that would be delicious. A mix of different shredded cheeses does tend to work best – marble is a good idea. It should be identical. I listed whole wheat because that’s our favorite for grains and flavor, but sometimes we use white pasta, and have found little difference between the two in terms of cooking times or amounts. I noticed your new recipe design immediately. Nice. I like it, especially the easy print option. I am always open to tips on one pot dishes. 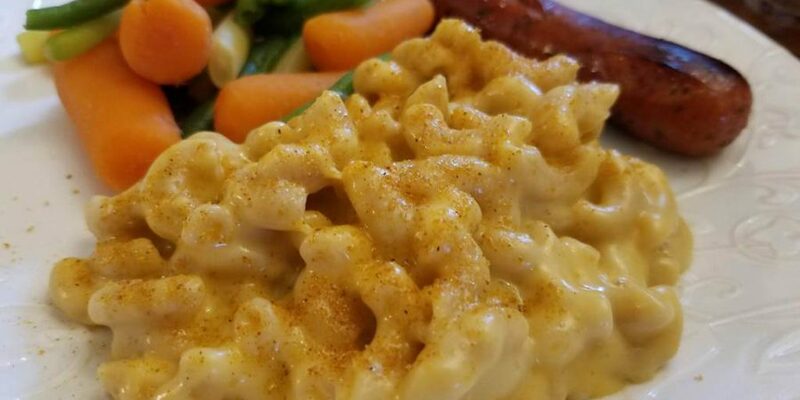 🙂 We love mac and cheese, especially in the summer since it pairs really well with lots of picnic food. I too, love the dish where it’s raw and bakes together in utter deliciousness for three hours on 225-250. Mmm! Yum. Any chance you would share this recipe with me? I won’t share it publicly on the blog without your permission, but I have been hunting for a raw-bake recipe as well, and haven’t found one yet that I love. The slow baking just might do the trick!